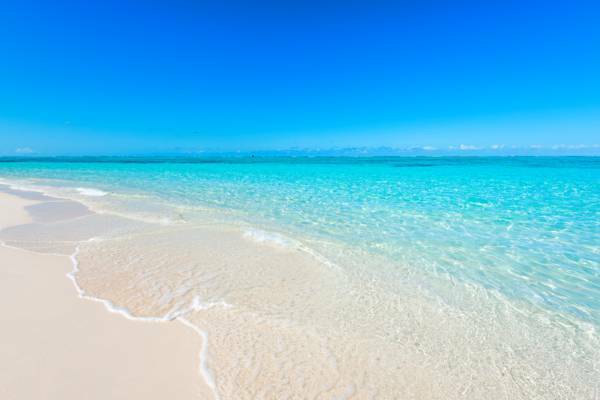 The beautiful Pumpkin Bluff Beach, North Caicos. The Pumpkin Bluff coastline offers some of the nicest beaches on North Caicos. Although centrally located, this area see very few visitors due to the accesses being easy to overlook. The beautiful water at Pumpkin Bluff Beach. For the inland region on North Caicos, see Pumpkin Bluff. The Pumpkin Bluff area offers several small scenic beaches interspersed between limestone bluffs and cliffs. 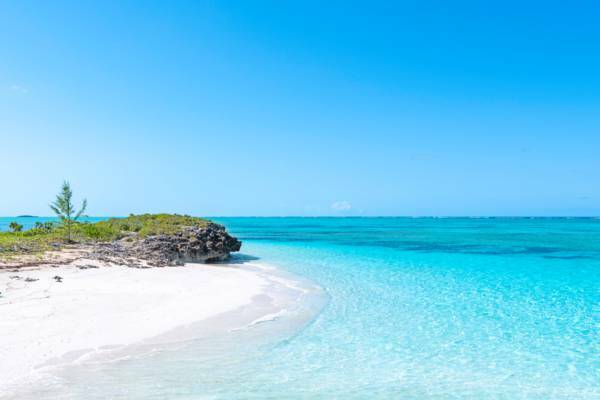 Although this section of coastline isn’t extensive, the spectacular water and clean sand here make for what is probably the finest beach for swimming on North Caicos. At low tide, there is a continuous beach at the bottom of the low cliffs, essentially connecting all of the beaches on North Caicos. Although centrally located, Pumpkin Bluff Beach is secluded, easily missed, and tends to see very few visitors. Although almost entirely having succumbed to the elements now, the bow of a wrecked freighter still remains on the barrier reef 2800 feet (853 metres) from shore. This vessel was the River Arc, an abandoned drug running tanker ship that appeared in the Turks and Caicos and drifted onto the reef. The tranquil ocean colours at Pumpkin Bluff. The scenery of the drive to Pumpkin Bluff from Sandy Point Marina (where the passenger ferry lands) is quite nice. Several inland saline ponds are passed, including Mangrove Pond, Mud Hole Pond (more scenic than the name suggests!) Moore Hall Pond and Pumpkin Bluff Pond. The ponds in the Pumpkin Bluff region are a haven for the larger wading birds. Although sightings are not quite as predictable as they are at Flamingo Pond Overlook, it’s common to spot flamingos, reddish egrets, tri-coloured herons, and yellow crowned night herons. In the thick surrounding vegetation of sabal palms and silver buttonwoods, mangrove cuckoos and Cuban crows can be seen as well. The beautiful coasts of Three Marys Cays and Hollywood Beach are found quite close to Pumpkin Bluff. A small abandoned hotel, the Prospect of Whitby, is located on the eastern edge of Pumpkin Bluff Beach. This failed hotel has gradually become overtaken by dense vegetation. Hidden in the jungle are about a dozen rooms, a swimming pool, tennis court, dive shop, lobby, and support laundry and restaurant kitchen facilities. A small trail leads over the coastal bluff to the beach here. The best access for Pumpkin Bluff Beach, this is also an excellent stop for the adjacent Hollywood Beach. It’s possible to drive quite close to the beach.